New officers of the 2018-19 school year were installed at the close of the May 4, 2018, program. 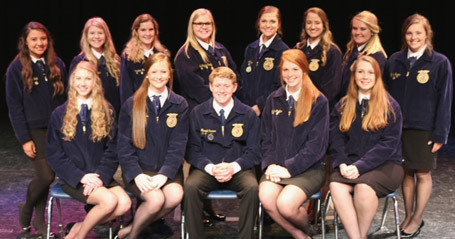 Officers are: Garrett Cramer (president), Meredith Oesch (1st vice president), Kennedie Kieffer (secretary), and 2nd vice presidents: Sydney Baxter, Rachel Holt, Kaylee Lewis, Maggie Pfaff, Montana Plattner, McKayla Shady, Malloree Summers, Catey Trout, Caroline Warren, Madelyn Wilford. Assistant officers for the 2018-19 school year are Seth Hansen (president) Trace Rardon (vice president), Colby Gillespie (second vice president), Lucas Campbell (secretary), Tucker Wagers (treasurer), Connor Keithley (reporter), Tucker Burtch, sentinel, Mason Baxter, chaplain), Warren Meservey (parliamentarian), Chloe Funk (historian). The National FFA Organization, formerly known as the Future Farmers of America, provides leadership, personal growth and career success training through agricultural education. The national organization has more than 653,359 student members who belong to one of 8,568 local FFA chapters throughout the U.S., Puerto Rico, and the U.S. Virgin Islands. The organization is also supported by 344,239 alumni members in 2,051 alumni chapters throughout the U.S. The FFA mission is to make a positive difference in the lives of students by developing their potential for premier leadership, personal growth and career success through agricultural education. 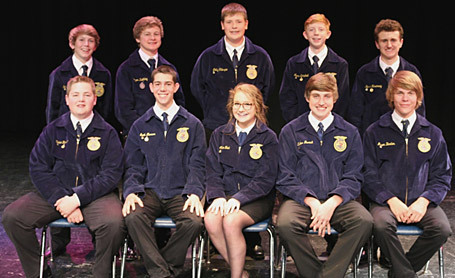 The National FFA Organization operates under a federal charter granted by the 81st United States Congress, and it is an integral part of public instruction in agriculture. The U.S. Department of Education provides leadership and helps set direction for FFA as a service to state and local agricultural education programs. The National FFA Organization changed to its present name in 1988, in recognition of the growth and diversity of agriculture and agricultural education. For more FFA information, click here!